June 9, 2017 By Tina M 36 Comments This post may contain affiliate links. Read my disclosure policy here. The “Blue Bible” The NUMBER ONE Thing I wish I had done before our trip to Hawaii was to buy the Hawaii revealed guidebooks at least a month before our trip. Several people had recommended them to me for great Hawaii tips, but I didn’t pay too much attention until a couple of weeks beforehand. Last year we went to Kauai and Maui, and this year we went to Oahu and Maui. So keep a lookout, because I’m going to be overblogging Hawaii tips galore! If you are trying to decide between Maui or Kauai, see my Maui vs Kauai comparison post. If you are going to Oahu, see my North Shore Oahu post specifically about what not to miss on the North Shore. 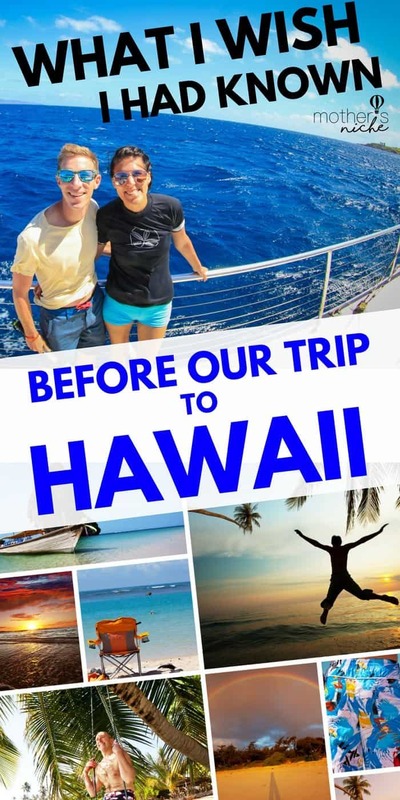 We now also have a travel guide for the Big Island Hawaii! Snorkeling. 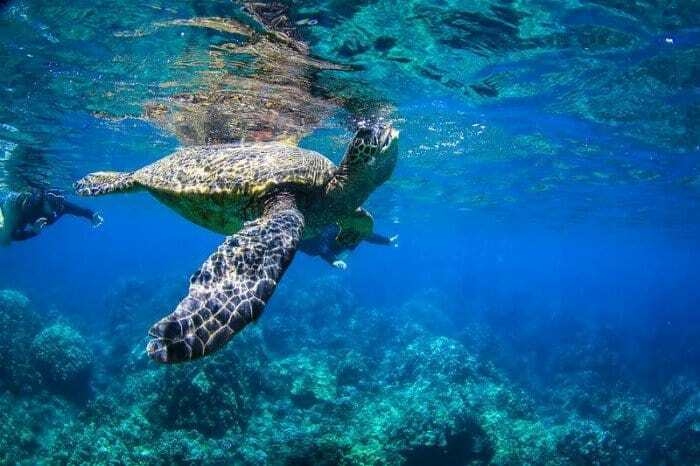 Snorkeling will likely be a part of your Hawaii vacation (If you’ve read my article 103 Free Things to Do in Oahu, it’s one of my favorite things to do in Hawaii). Whether it’s a fun boat tour, or doing it on your own, snorkeling is just plain awesome. The first time we went, we didn’t take snorkel gear with the intent to rent. Sure, it saved room in our luggage, but for the amount we paid to rent, we could have just checked an extra bag. The second year we went, we heard great things about the full face snorkel masks, and after reading reviews for several hours, we ended up getting these ones and taking them with us. GAME CHANGER! These things are amazing, and everyone in our group agreed they were the best money spent our whole trip. No fogging, no water in your mouth or snorkel, and effortless breathing since you can breathe normally with them. My mom didn’t have one, and refused to go snorkeling unless she was using one of our masks. She was a beginner, so the mask really put her at ease. Footwear. While we are on the topic of snorkeling, I need to add a little tip on footwear. Please take some water shoes with good grip on the sole! Especially if you are going to travel around to different snorkel spots on the island. All the best snorkel spots are in rocky, coral areas which means you can really scratch yourself up if you are trying to get into the water and waves are knocking you over onto the rocks. Or if you step on sea urchins…or something worse. My dad was wearing open toed shoes and totally ripped his toenail right off his big toe trying to get into the water. It was so sad! I also wore my water shoes and Chacos on all the hikes, so I was wearing them ALL THE TIME and putting them to good use. Clothing. This is one of my biggest Hawaii tips. I don’t sunburn very easily, and when I do it’s not bad, so I have never owned a rash guard in my life. But for Hawaii, they are a must. I now own 3 rash guards. The sun is different in Hawaii (right on the equator, so the sun is direct). And since it’s humid, you might not think you are burning, but you really are. Plus, if you plan on snorkeling, that’s a lot of direct sun right on your back…which is my least favorite spot to get a sunburn! Even if you plan on coming back with a nice tan (always my plan), you should pack a rash guard. If you don’t want to peel, you’ll want to give your skin a break for a day or so after it’s been in the sun a long time. Even on your hikes there will almost always be water, waterfalls, or cliffs to jump off. Photography and Video. This tip is HUGE. Almost everything you do in Hawaii will involve water. There’s also issues with burglary in Hawaii, so you want to make sure you never leave anything in the car. This has convinced me to never bring my nice camera to Hawaii. Instead, we bring our GoPro. In fact, I have seen more GoPro’s in half a day on Hawaii, than I have seen in my entire life. They are a must! Plus, it’s so nice when we go on our adventures and we get that pitch at the end for buying photos for an exorbitant amount, and we can easily say no because we got some awesome shots on the GoPro. 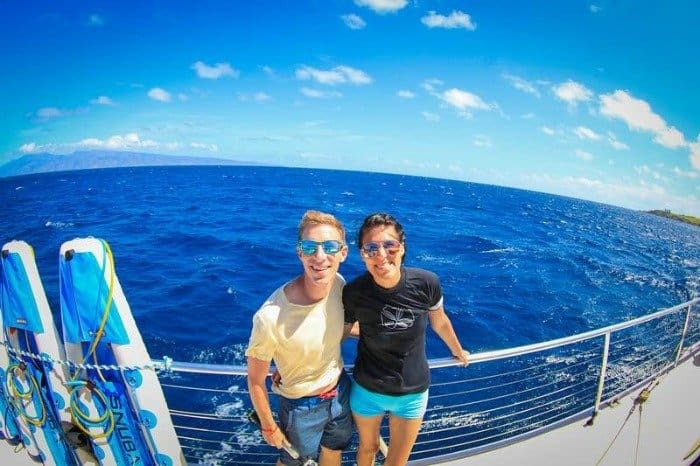 Here’s an example….on the snorkel boat trip we went on, photos were $40 for ONE PHOTO! Cray-cray!! 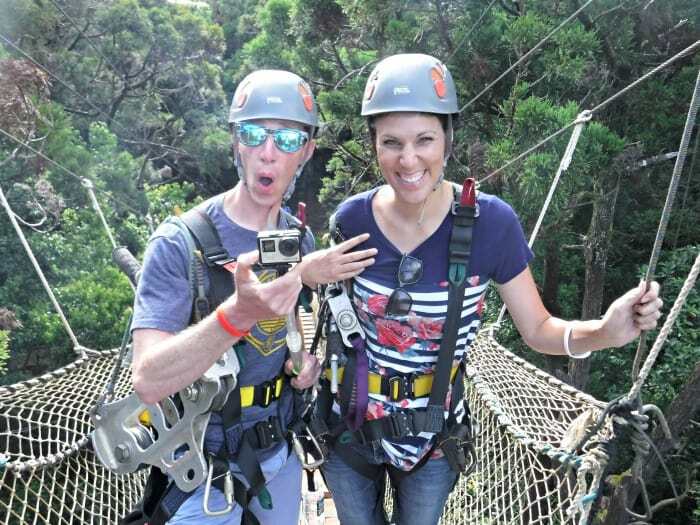 This picture below is a shot that was taken at Kapalua Ziplines of my husband with his Go Pro in hand. This is the only place we have ever purchased the photos at the end. And when we got home, we realized that my husband got way better shots with the GoPro. 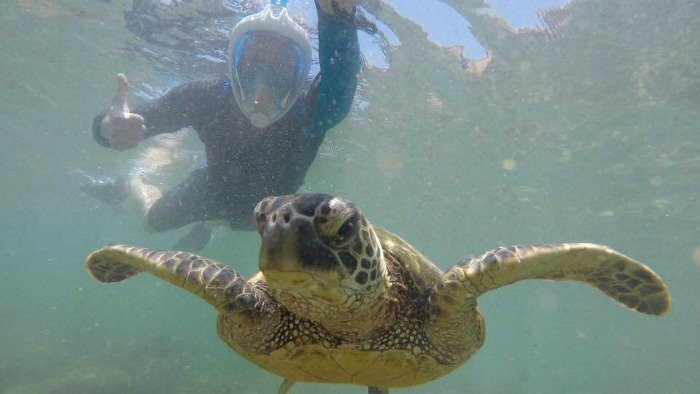 Plus, snorkeling is way more exciting when you see the HUGE turtles and know that you get to take home pictures of them 🙂 We got the GoPro Hero4 for the touch screen viewfinder so that we can playback movies straight from the camera after shooting them. Visiting Multiple Islands. If you are going to fly all the way to Hawaii, you might as well visit multiple islands, as inter-island flights aren’t that expensive. Also, now that Southwest will be flying to Hawaii, it shouldn’t be too hard to pay for your flight to Hawaii entirely with points. See my post on how to fly to Hawaii for free for more info on this. I had no idea how thorough these books are, as well as fun to read (I don’t read books very often so part of me worried I wouldn’t have enough interest to read through them, or I wouldn’t have time). Unbiased: If you are planning your Hawaii vacation via the internet, almost everything you are reading is biased. Meaning, websites and blogs are recommending certain places because they make a commission off of it, or they got a free hotel meal or activity for their recommendation. What I love about the guidebooks is that all their Hawaii tips are completely unbiased. He does all of his reviews anonymously and he pays for everything that he does. These books are SO DETAILED. He has done it all. I had a hard time putting down the books because they were so well put together, and the author is pretty funny too. The sad thing is that even after all my months of planning, there were so many things he mentioned that I wish I had done differently. Many of his recommendations were golden, and as such were already booked out when I called to make reservations. If you get the books at least a month in advance (ideally a couple of months), you can make sure you get in with all the best activities before they sell out. 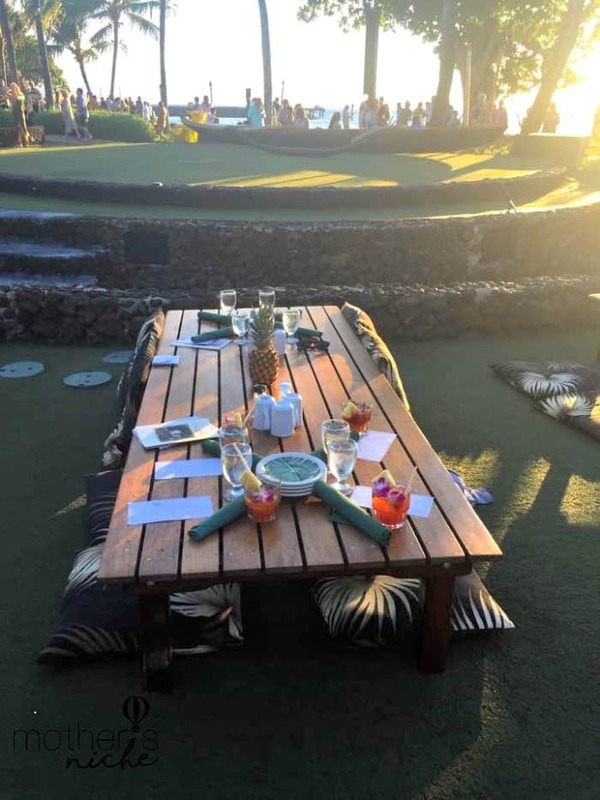 When I called to make reservations for the very best, most authentic luau (The Old Lahaina Luau), they had been sold out for a month already. The next year that I went, I made reservations well in advance and had a wonderful evening! Depending on where you are going, there is a guidebook for each island: Maui revealed, Kauai Revealed, The Big Island, and Oahu Revealed. The one caution I would give you is to call ahead on some things. Some of the restaurants have since been shut down, so we drove to get food and sometimes the place didn’t exist anymore. Keep an eye out over the next couple of weeks! We have tips for each island (with videos) coming your way! Awesome advice and great timing! Definitely getting the snorkeling mask and rash guards for the kids. Thank you!! We are heading to the Big Island and Kauai in mid August. I’ll let you know how it goes. Sending healing thoughts and wishes for a speedy recovery. Just returned from Hawaii (Big Island) where the full face snorkel masks made the news! They are linked to DEATH. Be careful if you use them. They suspect that there is a build up of carbon dioxide leading to death of the swimmer without any symptoms. BEWARE. The old snorkel masks work great. In fact they do believe the rash of drowning’s in Maui in 2017 are indeed linked to the full masks. 9 people in two weeks. I suggest people research before using. Where did you guys go Ziplining? I saw it in the video but I couldn’t find the name of the place on this post! Author of the books is Andrew Doughty. “_____” Revealed. Each island has it’s own book. We’re going to Maui in December; already read the book cover to cover a couple of months ago. Will read it again and bookmark everything before going. Great information! There is a link in the article that will take you to Amazon to purchase them. Ah! I’m so sorry you had that experience with Island Air! I live here and fly them almost monthly and have never had that happen 🙁 In fact, I always recommend them over Hawaiian because the service is just overall better. That said, your tips are SPOT ON! I’m glad you enjoyed your vacations! It really depends on what you enjoy. I would say that if you like staying busy and want to visit places like Pearl Harbor, Dole Plantation, Polynesian Cultural Center, etc., and do a good bit of shopping, go to Oahu. If you want a more relaxed time and viewing the pretty scenery, I would say Kauai. Hi, very good advice about rash guards. I’ve made many HI trips, I usually bring a shortie wetsuit but rash guards easier to travel with. Great pictures. We’ve also used those Maui Revealed etc. books for all our Hawaii trips — however Hawaiian locals don’t like those books, they feel like they encourage trespassing etc. I’ve noticed the same thing about packing — I come home with clean clothes never worn but more swim/beach wear comes in handy. There are also some VERY GOOD inexpensive apps to the islands that are a driving tour. They use GPS to guide you. Turn it on (make sure phone is plugged in) and let it run. As you drive, as the GPS picks up on the are around you, it will begin telling you the background and even where to park. They are the Shaka Guides. The one for the Big Island even led us to a crater that is not marked and very, very deep! Be careful if you’re hiking!! Do you remember the name of the driving tour app? I am super curious about this! We leave for Kona on the Big Island in December and are renting a car so we can hopefully see some super awesome sites! The very first thing you should do when you get there is stock up on all the island “books.” There are TONS of coupons in them and I love scouring them for discounts on places we usually go to or just to try something new. You can save a bundle of money. What are rash gaurds, never heard of them? If you had to choose between the two, would you attend the The Old Lahaina Luau or the PPC? Does the Lahaina luau show compare to the PPC night show? One other question- is it worth the $ to go to the Lahaina luau and do the luau and show at the PPC? Thank you so much! You have been so helpful. We are so looking forward to our first Hawaii vacation. We have purchased all that you mentioned. I am looking forward to the new snorkel mask. I would recommend one more thing, a nylon beach blanket! I have looked into the full face snorkel mask, I definitely will give those a try. Did you take fins also, or just use your swim shoes? My daughter and I are headed to Honolulu for her senior trip in a month. Anymore tips would be grateful. We will only be hanging out on the main island. Are there any good volcano tours? thank you for all the good advices. In which month did you go? Is the weather warm enough during Spring Break? Did you only use the GoPro for your pictures and the movie you showed from Maui? Just FYI, Hawaii is not directly on the equator, but it is just below the Tropic of Capricorn. So yes, you could experience direct sunlight depending on the time year. There are have been many drownings lately on my island of Maui, of tourists wearing those full snorkel masks. Please consider revising your advice to save lives. Also expensive items like Go Pros are an easy mark for thieves looking in rental cars to steal. I know it’s better business to talk about the fun but if you really want to tell the readers what are “game changers” you need to be realistic. Yes you have to buy the blue book. We have been to the islands many times and our favourite by far, is the Big Island- so big, so beautiful! You stay were you sun is, so that is Waikoloa. And you must spend a few nights down in Puna, swim in the volcanoe heated lagoons! Amazing! Everyone should read the news from Hawaii about snorkeling with full face mask. I speak with first hand knowledge of a tragic death. I would never snorkel with one. Do we need to bring our flippers? Or just face mask? It’s up to you! Some people don’t like snorkeling with flippers, and some do. If you want to use flippers and they will fit in your baggage, I would bring them so you don’t have to rent them. Island Air is out of business now, by the way. I prefer Mokulele airlines myself. No TSA with them. Hey there! Loved your article! I was planning on bringing my open toed Chacos in the water, but now I’m rethinking it… how did he rip his toenail off?! You mentioned you used them for hiking, my concern was the potential of spiky objects (I live around a lot of cactus), did you have any concerns with that and your Chacos? Hi! I just wanted to comment & tell you this is the BEST advice article I’ve read in relation to preparing for HI. Thank you for your honest advice. I’m looking foward to my first trip soon.